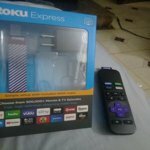 Roku Express delivers a smooth HD streaming experience on your big-screen TV at our best price. It’s easy to get started—just plug it into your TV with the included High Speed HDMI&reg; Cable, connect to the internet, and start streaming. With access to hundreds of free channels, there’s plenty to stream without spending extra. 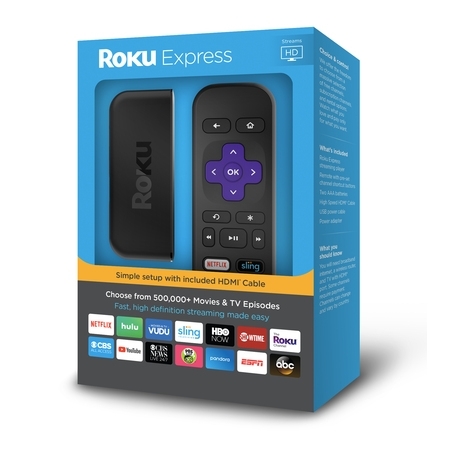 Roku Express delivers a smooth HD streaming experience on your big-screen TV at our best price. It’s easy to get started—just plug it into your TV with the included High Speed HDMI® Cable, connect to the internet, and start streaming. With access to hundreds of free channels, there’s plenty to stream without spending extra. It’s easy to get started - just plug it into your TV with the included High Speed HDMI® Cable, connect to the internet, and start streaming. With a short step-by-step setup and an easy on-screen experience, Roku Express is perfect for new users, but powerful enough for seasoned pros. Absolutely Fantastic - Love It! YAY! I got my Roku Stick and finished setting it all up, today! 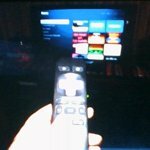 I went through and chose a bunch of my fave tv channels, to start out with - also looked over music channels, movie channels and various other free offerings (free games). I wish I had known about this alternative to cable, a lot sooner! The Roku "stick" is inexpensive, $29.00, with no monthly fees. It is so easy to install and set-up. Then watch just about anything. 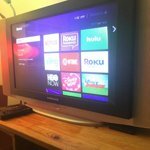 Some channels require payment, for a subscription (like Netflix, Hulu, BritBox, etc..) but there is so much content available, for FREE, it makes the Roku totally worth the $29.00 price tag. Plus, I finally cut the cord, with cable! Buh bye, crummy overpriced cable company! I will not miss you, or your monthly $150 bill, AT ALL!!! Love this Roku! Two thumbs up!!! 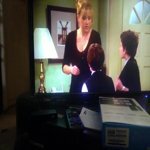 I love this streaming device because I used to be having cable for a long time now I always watch some TV shows,it's a wonderful deal that's why I just used this Roku so I can watch wherever I can at much as possible I can keep this for life by the cost of cable are too expensive and you can watch for free or less. 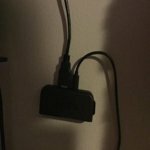 Works with my hd crtâs that have dvi in by using an adapter and using analog audio. Also works with my hd crts. Love the remote. Love the apps. Best thing ever was getting rid of my apple tvs! This is a great device for the price. If you don't have on, get one! It is also a pritty high resolution so it can reach 1080p! Purchased two of these little gems back in September and was able to completely sever my ties to cable television. Flawless. There was no "Free month of YouTube TV". You guys lied. I bought this for that purpose and because the Amazon Firestick went up in price. 29.98 was better than paying $40 for a firestick with voice remote functions. Can I get my code for the free month of YouTube TV? I will return it if you don't respond within 24 hours. I have to watch Hulu , Amazon Prime and Pluto. It is free and is a lot like a cable subscription service. 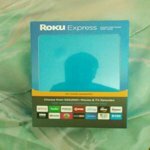 Purchased this Roku after my Rolu 2XS kept Crashing running Sling TV. Got it to see if Sling TV runs better. The Express is considerably smaller than the 2XS, which is nice. However, getting it to stay on my WiFi network during initial setup was a real challenge. The antenna in the device is really pathetic. There is no agent assisted support for this device so beyond some knowledge base articles, you are on your own. None of my other older Roku devices had problems staying on WiFi. Once I got the device setup, the initial experience with Sling TV was much better. The app never crashed as it does on my older device. But the WiFi reception issue continued to rear its ugly head, causing pauses during streaming. When it became really bad, the app did gracefully exit and redirect you to the Check WiFi Connection page in Settings. I ended up trying another Express unit, which was marginally better; after moving this device around, I was able to find an orientation for the device where it would stay on the network a little better. The access point is only a few feet away! Remember, none of my older Rokus ever had connection problems like this, and they've been used for years. I would recommend a Roku for the mix of apps available, but stay away from this pathetic excuse for a streaming device and get one of the more expensive ones offered. In this case you don't even get anything for what you pay for and there is no agent support for this device. Stay away! I bought this for my projector in the theater room as I didn't need one with volume control. I started having issues after only a few months and it wouldn't connect to the WiFi eventhough it was 6 inches from the router and the other two Roku devices throughout the home were connected and working. Roku does not offer tech services for this device. You aren't even able to call in to talk to anyone to help trouble shoot. Roku is a great streaming device, but this budget friendly model is not worth the discount. If Roku won't provide call-in tech service they need to discontinue selling this device.